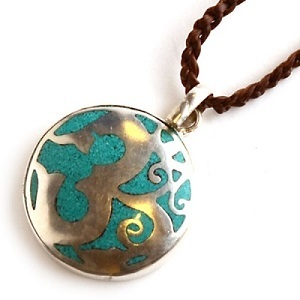 This beautiful Om Swirl necklace is rendered in silver and turquoise and is strung on a braided leather cord. Om is an icon found in ancient and medieval era manuscripts, temples, monasteries and spiritual retreats in Hinduism, Buddhism, and Jainism. The symbol has a spiritual meaning in all Indian dharmas, but the meaning of Om varies across the various traditions.